Laumontite is a mineral, one of the zeolite group. It is a white monoclinic mineral consisting of a hydrous calcium and aluminium silicate. Its molecular formula is Ca(AlSi2O6)2·4H2O, a hydrated calcium-aluminium silicate. Potassium or sodium may substitute for the calcium but only in very small amounts. It is not a stable mineral, losing water in its structure upon exposure to air. 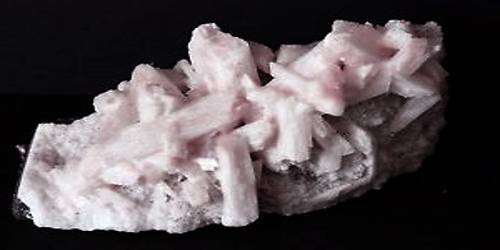 This causes Laumontite to be white and powdery and will cause specimens to crumble when touched. It is a common mineral, found worldwide. It can be locally abundant, forming seams and veins. Laumontite is a handsome mineral. When pure, the colour is colourless or white. Impurities may colour it orange, brownish, grey, yellowish, pink, or reddish. It was named after Gillet de Laumont (1747-1834), a French mineralogist and hunter credited with discovering this mineral in Brittany, France in 1785. Colour: White, colourless, yellowish, brownish. 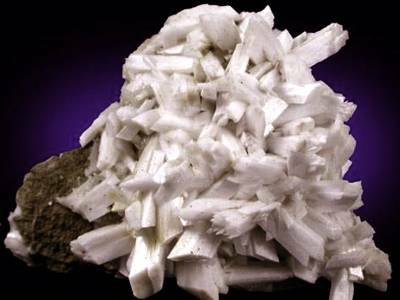 Its columnar crystals can project above the clutter of crystals at its base and appear like a monument above a desert plain. Its crystals can also form smaller, almost acicular jutting prisms that look like a rugged landscape. It is very brittle. The Mohs scale hardness is 3.5-4. It has a vitreous lustre and a white streak. Luminescence: Fluorescent, Short UV=Weak white, Long UV=weak white. Occurrence: Of hydrothermal origin, lining cavities in igneous rocks. Thick sedimentary beds rich in laumontite may form by decomposition of analcime or metamorphism of plagioclase. Maybe authigenic, cementing sandstones. It is found in hydrothermal deposits left in calcareous rocks, often formed as a result of secondary mineralization. Host rock types include basalt, andesite, metamorphic rocks and granites. Notable occurrences are India; Paterson, New Jersey; Pine Creek, California; Iceland; Scotland; and the Bay of Fundy, Nova Scotia. Prehnite pseudomorphs after laumontite (epimorphs) have been found in India. Association: Zeolites, apophyllite, datolite, calcite, chlorite. It is frequently associated with other zeolites, including stilbite and heulandite.